This public symposium focused on a prehistoric hominin that has recently gained international celebrity status, the enigmatic Homo floresiensis. Since the announcement of this taxon in 2004, Homo floresiensis has emerged as one of the most fascinating and perplexing twists to the story of human evolution in recent history. Dated to only 17,000 years ago, these “hobbits” possessed a shocking number of primitive morphologies more reminiscent of earlier Homo erectus, or even Australopithecus, than modern humans. The symposium offered a unique opportunity for the researchers currently in the process of describing and analyzing the Homo floresiensis remains to update the general public on their thoughts on the profound implications of this material for understanding the nature and tempo of human evolution. Peter Brown is a Professor and holds the Chair in Palaeoanthropology at the University of New England, Australia. His principal research interests are in the origins, evolution and dispersion of humans, and their extinct relatives, in Asia and Australasia, as indicated by their bones and teeth. Peter was responsible for describing the first skeletal remains of Homo floresiensis and assigning it to a new species. He is currently completing research on some late Pleistocene human fossils from southeastern Australia, which may help with the continuing debate over the origin of the first Australians. Dean Falk is the Hale G. Smith Professor of Anthropology at Florida State University . Her research focuses on early hominids, brain evolution, comparative neuroanatomy, primate behavior, and cognitive evolution. Her most recent book is Finding Our Tongues: Mothers, Infants, and the Origins of Language. She is currently a resident scholar at the School for Advanced Research in Santa Fe, New Mexico. Charles Hildebolt is a Professor of Radiology at the Mallinckrodt Institute of Radiology at Washington University School of Medicine and an Adjunct Professor of Anthropology at Washington University. For over 20 years, he has used computed tomography (CT) in studies of human variation in health and disease. He has collaborated extensively with Professor Dean Falk in studies of brain evolution, with their most recent collaboration involving the use of computed tomography to study the brain (and other cranial features) of Homo floresiensis. William Jungers is a Distinguished Teaching Professor and Chairman of the Department of Anatomical Sciences at Stony Brook University . His research interests include functional anatomy, primate evolution and paleoanthropology. He has conducted paleontological fieldwork in Madagascar and Indonesia . He is the editor of “Size and Scaling in Primate Evolution” and co-editor of “Reconstructing Behavior in the Primate Fossil Record.” He is currently involved in the description and analysis of the postcranial skeleton of Homo floresiensis and is co-editing a special issue on the “hobbits” for the Journal of Human Evolution. Susan Larson is a Professor in the Department of Anatomical Sciences at Stony Brook University. Her research interests focus on the functional interpretation of musculoskeletal morphology of humans and nonhuman primates. Most of her work involves using laboratory methods to test hypothesized form/function relationships in order to more confidently reconstruct the behaviors of extinct primate species. She has recently been involved in applying her knowledge of forelimb functional morphology to the analysis of Homo floresiensis. Richard Leakey is Professor of Anthropology at Stony Brook University and former Director of the Kenya National Museums and the Kenya Wildlife Service. His field work at Lake Natron on the Kenya-Tanzania border, in the Lower Omo Valley in Ethiopia, and all around Lake Turkana in Kenya, yielded a treasure trove of hominid fossils that has provided much of the paleontological record on which our understanding of human evolution is based. Leakey was elected Fellow of the Royal Society of London (FRS) in 2007. He recently founded WildlifeDirect, an online service that supports conservationists and is currently Chair of the Board of Trustees of the Turkana Basin Institute at Stony Brook University where he convenes the Human Evolution Series. Mark Moore holds a Postdoctoral Research Fellowship through the Australian Research Council. He explores the engineering ‘design space’ of stone tool manufacture world-wide through theoretical modeling, analysis of artifacts, and experiments in stone flaking. His work on Australasian assemblages explores the notion of ‘basic skills’ stone working in the context of hominin cognitive evolution. Mike Morwood obtained his MA in archaeology at Auckland University (NZ),and his PhD at the Australian National University, where John Mulvaney was one of his supervisors. He has been on staff at the University of New England since 1981, and more recently at the University of Wollongong. In Australia, he has undertaken research projects in a number of regions including Southeast Cape York Peninusla, the North Queensland Highlands and the Kimberley. Since 1997, however, he has focused on interdisciplinary research projects in Indonesia, on the islands of Java, Sulawesi, Flores and Timor. He co-lead the team of Indonesian and Australian scientists who discovered the skeletons of a tiny new species of human, Homo floresiensis – known in the popular press as “Hobbit”. Thomas Sutikna is a research associate of the National Research and Development Centre for Archaeology in Indonesia. His research focuses on Settlement Archaeology, especially on cave habitations. He has excavated extensively throughout Indonesia, and since 2001 he has directed the Liang Bua (Flores) cave excavations that contain the first and currently only evidence of Homo floresiensis (from ca 95,000 BP – 17,000 BP). Matt Tocheri is a paleoanthropologist in the Human Origins Program of the Department of Anthropology at the Smithsonian Institution’s National Museum of Natural History. His main research interests surround the evolutionary history and functional morphology of the human and great ape family, the Hominidae. In particular, his research focuses on the complex anatomy of carpal (wrist) and tarsal (ankle) bones to test functional and phylogenetic hypotheses. 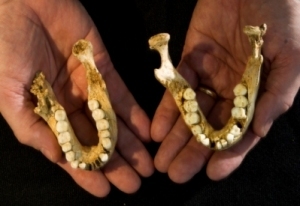 His work on the wrist of Homo floresiensis, published in 2007 in the journal Science, has added another fascinating chapter to the emerging story of the ‘hobbits’ of human evolution.